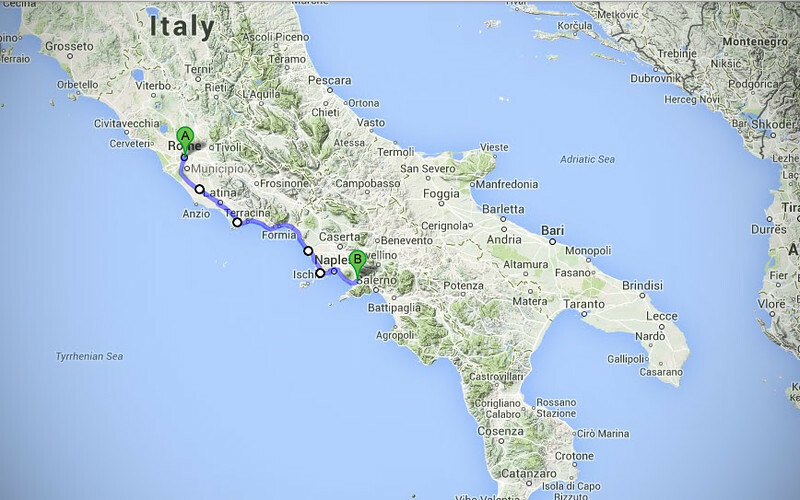 From Rome, we tried to hug the western coastline as we ventured further south. 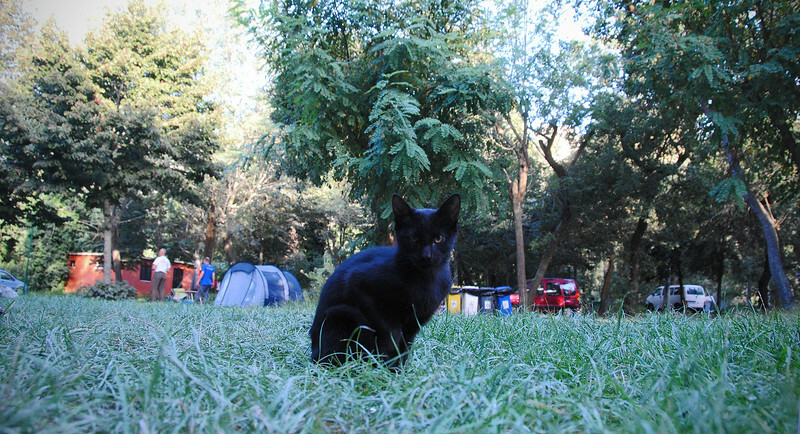 We stopped for the evening just outside of Naples at a campsite we found on the Internet, but it turned out to be The Most Expensive Campsite In The World, because it was situated on the grounds of a dormant volcano. We didn't know this beforehand, but since it was starting to rain, we decided to set up our tent instead of trying to look for another place. 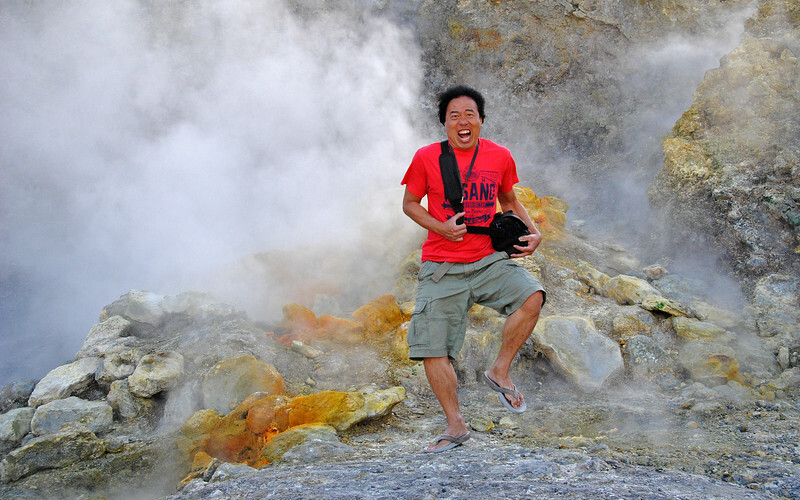 In the morning, before leaving, I told Neda, "We should probably go see their stupid volcano to make it worth our money". 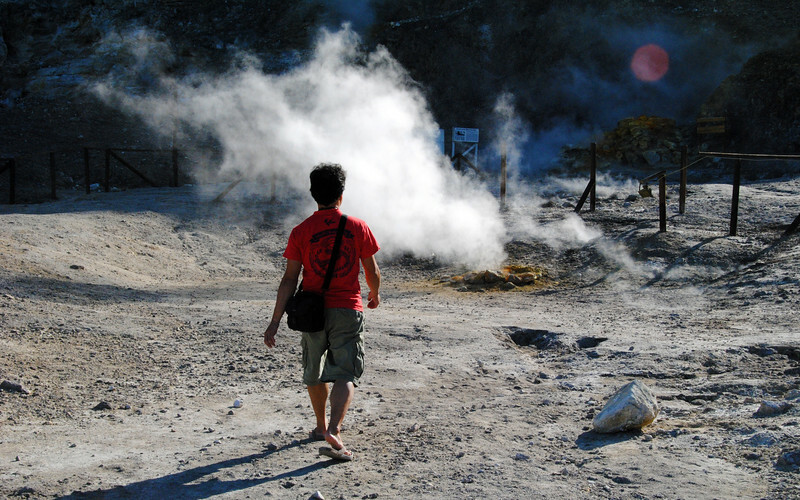 It wasn't very large, you could probably walk around the rim of the crater in 15 minutes. 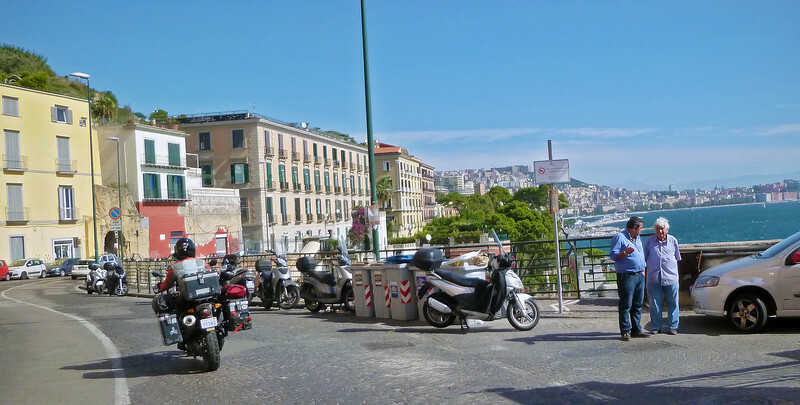 We continued south on the coastline trying to find the closest road to the sea, and we were rewarded with a scenic cobblestone ride into Naples. For once, the sun was out and we peered over the edge of the road as it twisted around the steep cliffs overlooking the blue Tyrrhenian Sea. A very nice ride! Don't f*** with the Scooter Mafia! This car parked in scooter parking and paid the price. 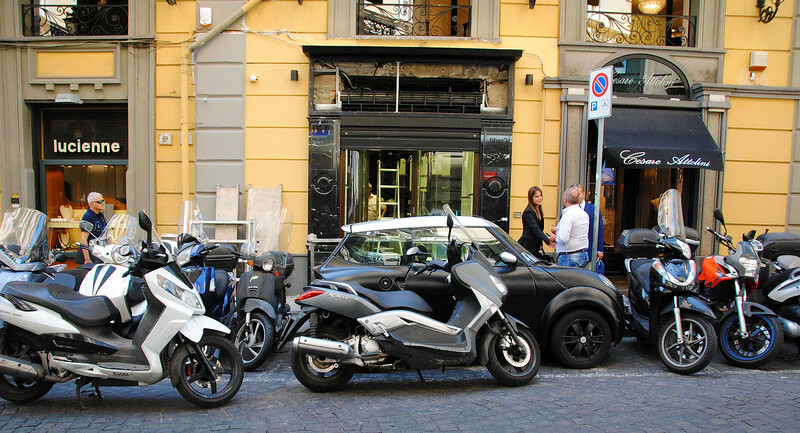 We just can't get used to the Italian siesta, called the riposo, which closes down all shops and stores from... basically whenever the sun is in the sky. We always seem to be perpetually off-sync, knocking on shuttered doors hoping to get gas or food while we're on the road. Ever seen a cake eat a pizza? 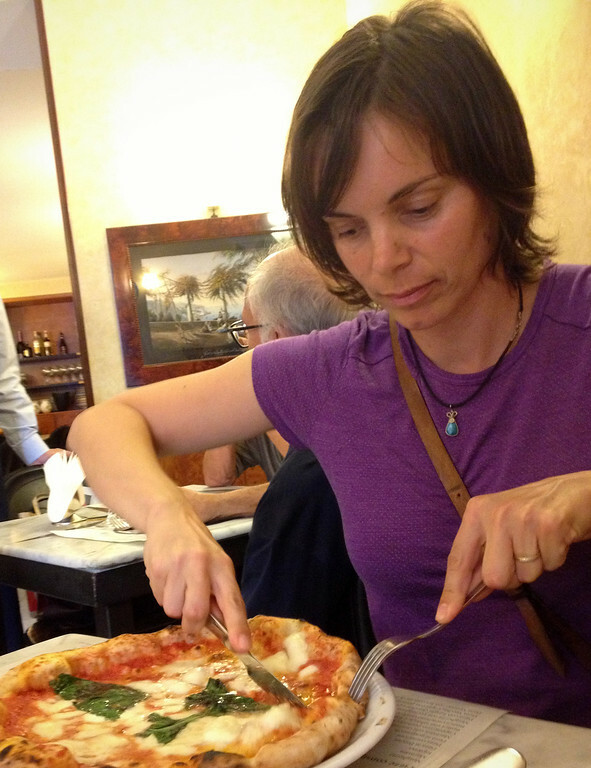 Did you know pizza was invented in Naples? They take their pie-making very seriously in the city. There's even an Associazone Verace Pizza Napoletana, which certifies pizzerias around the world to the Neopolitan standard according to an 11-page document that outlines stringent regulations like the acidity of the yeast, thickness of the pie, and the ingredients like the fresh tomatoes and buffalo cheese, which all have to come from the area surrounding Naples. This pretty much guarantees that the only certified Pizza Napoletana can only come from Naples. After eating one of these certified pies, I feel a bit more Italian so from now on, I'm going to start using the Italian names of the places we're visiting. For the Mangiacakes out there, here's a quick reference: Napoli = Naples, Roma = Rome, Bologna = Baloney! 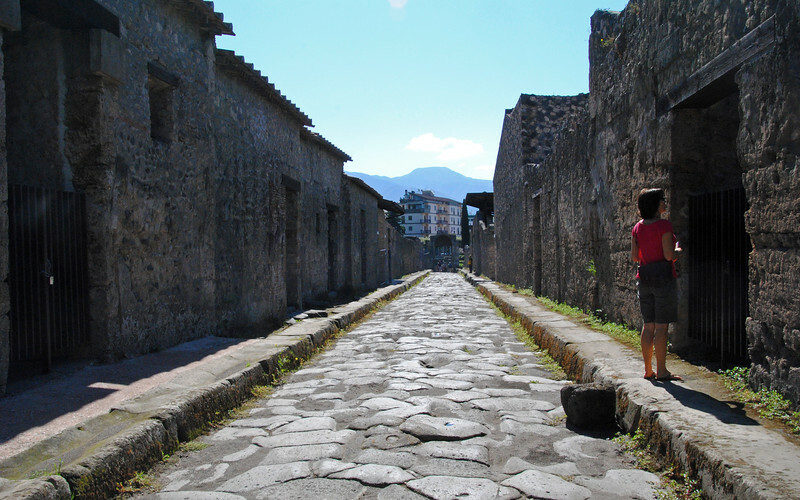 Because of the costs of accommodations in Italy, we're finding that we need to be more diligent in researching and booking places in advance, instead of rolling into town and knocking on doors like we did in Latin America. We're refining this process and we're pleasantly surprised at how many private homes are opening their doors to travelers via AirBnB. Very good value for the money. 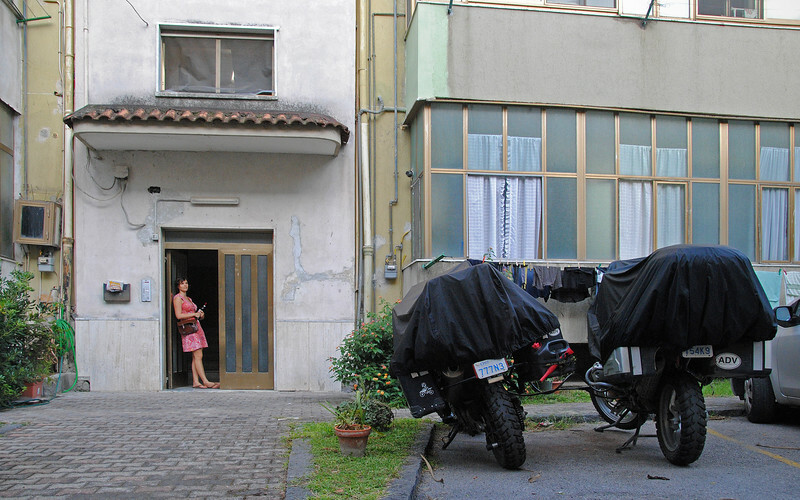 HostelWorld remains a distant second because of the relative low value for what you pay for, and there seem to be plenty of RV campsites all over Italy, which is our cheap and easy fallback plan. The trick is finding one that doesn't have a volcano or spa attached to it that hikes up the price. 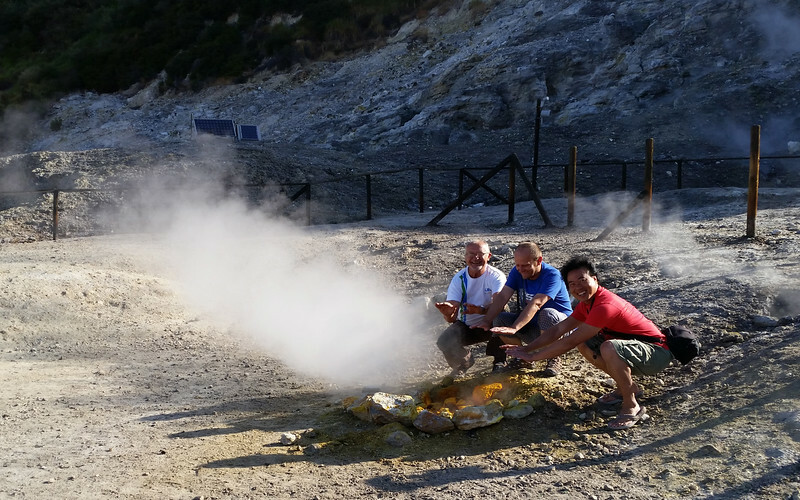 We opted to stay outside of Napoli, just a couple of kms away from Pompeii, which we visited the next day. There are places that we stumble upon as we're traveling that just pop up on our radar as we're planning our next day's ride. 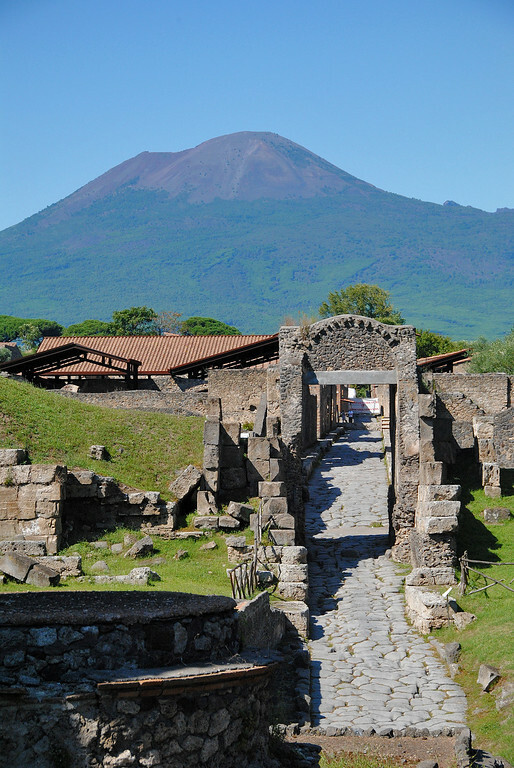 Pompeii was one of them. I had no idea it was this close to Napoli. 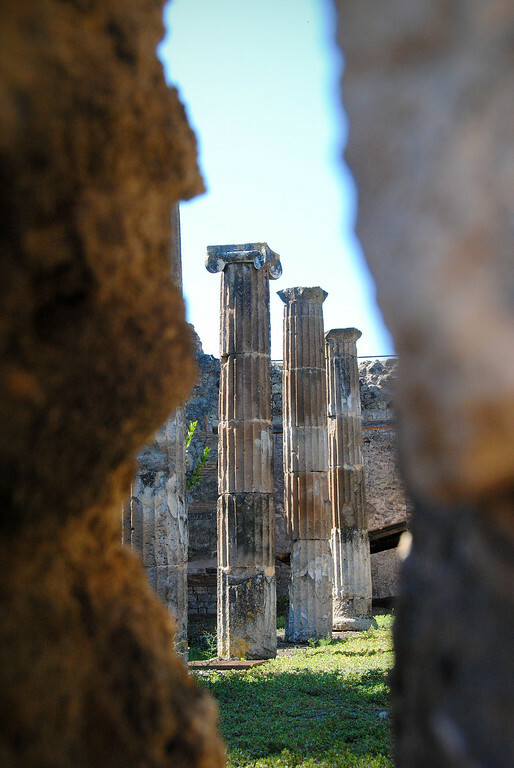 We had planned to stop in the area to try some authentic pizza Napoletana and ended up visiting the ruins that had captivated my imagination when I was a kid. One of my favorite TV programs growing up was a sci-fi-documentary series called In Search Of... I remember being transfixed for a whole half-hour every week as Mr. Spock himself spun tales of pseudo-science explaining how the Mayans worshiped Ancient Astronauts and how Mount Vesuvius erupted blanketing Pompeii in a layer of thick hot ash, instantly preserving everything it covered. I remember vividly the plaster casts of the bodies caught in their last moment of anguish and how that both haunted and fascinated me at the same time. 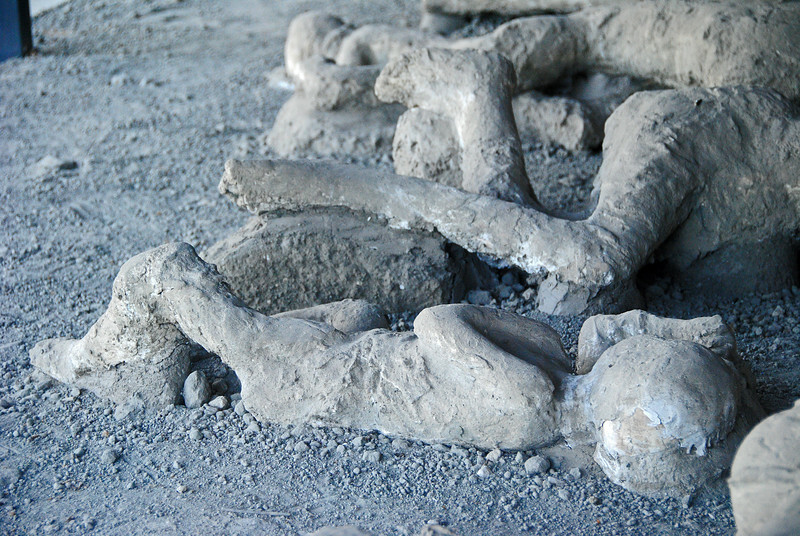 The biggest mystery was why Pompeii was the only city that had human bodies preserved in such detail that even the folds of their clothes can be seen in the plaster casts made from the hollows of the ashes. 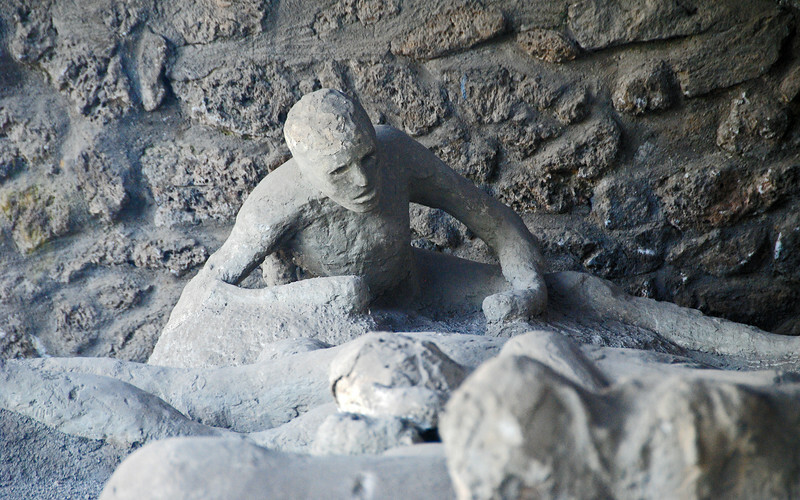 Other cities near Vesuvius showed no such preservation, only bones and teeth remained of their citizens as the pyroclastic surges of hot toxic gases and ash incinerated their bodies. 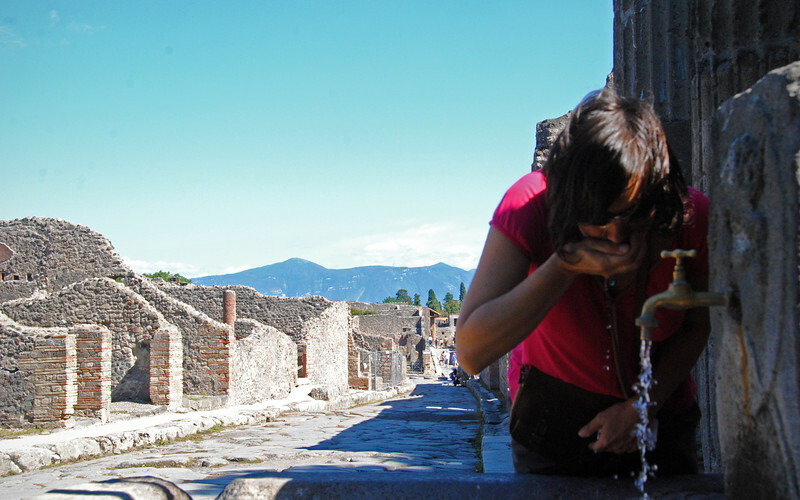 A recent documentary I watched explained that Pompeii was exactly the right distance away from Vesuvius that the surge of hot gases was just the right temperature to kill a person - boiling their brains in their skull - but not hot enough to destroy their flesh and clothing. 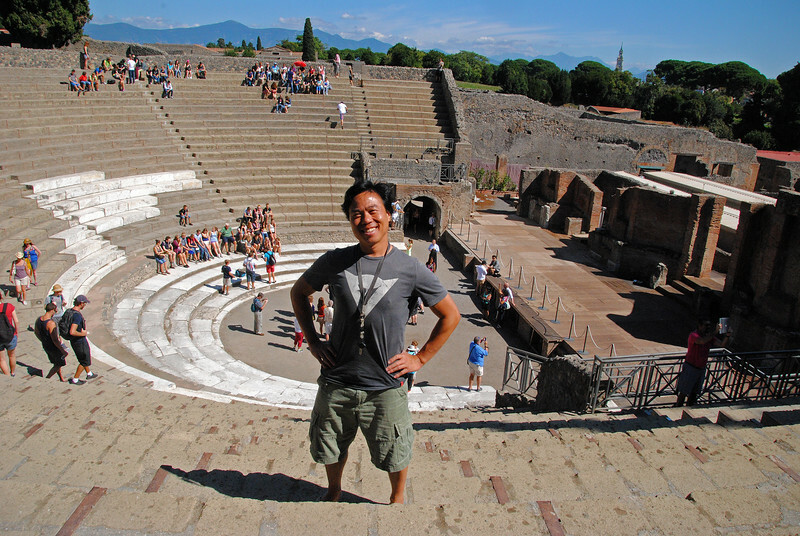 "No Neda, this amphitheatre is not as pretty as Pula's..."
After this visit to the ruins of Pompeii, I have a new mission for our trip. I'm going to download all those old episodes of In Search Of... and then we're going to ride to every place covered in each episode. Next stop: The Lost City of Atlantis!